Look up antechamber in Wiktionary, the free dictionary. 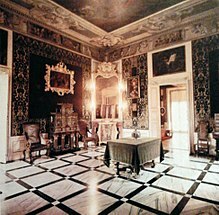 Example of antechamber in a large house or mansion. An antechamber (also known as an anteroom or ante-room) is a smaller room or vestibule serving as an entryway into a larger one. The word is formed of the Latin ante camera, meaning "room before". "Antechamber" comes from the French antichambre. In some cases, an antechamber provides a space for a host to prepare or conduct private business away from a larger party or congregation. Antechambers are often found in large buildings, homes, or mansions. They are also very common in palaces and crypts. In a theme park, an antechamber may be used to tell guests about a ride before they experience it. This article incorporates text from a publication now in the public domain: Chambers, Ephraim, ed. (1728). "Antechamber". Cyclopædia, or an Universal Dictionary of Arts and Sciences (first ed.). James and John Knapton, et al. "antechamber - Dictionary Definition". Vocabulary.com. Retrieved 2019-01-11.